The endocannabinoid system (ECS) plays a central role in the regulation of learning and memory processes. The fine-tuned regulation of neural transmission by the system is likely to be the mechanism underlying this important function. 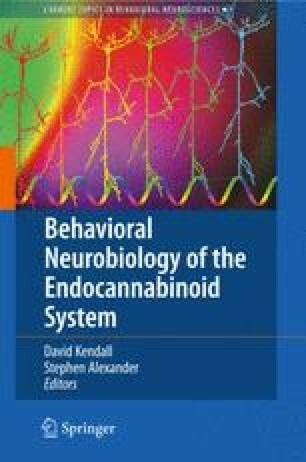 In this chapter, we review the data in the literature showing the direct involvement of the physiological activation of cannabinoid receptors in the modulation of different forms of learning and memory. When possible, we also address the likely mechanisms of this involvement. Finally, given the apparent special role of the ECS in the extinction of fear, we propose a reasonable model to assess how neuronal networks could be influenced by the endocannabinoids in these processes. Overall, the data reviewed indicate that, despite the enormous progress of recent years, much is still to be done to fully elucidate the mechanisms of the ECS influence on learning and memory processes.